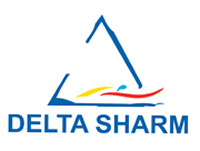 Delta Sharm Resort, Sharm El Sheikh, Egypt has a large variety of apartments with different sizes, styles and locations (pool view, garden view, internal street view). There are studios (like hotel room), apartments with living room and 1, 2, 3 bedrooms and villas (2 floors having roof) with 2, 3 bedrooms. All units have kitchen and most of them have one or more terraces. Total project area: about 227,000 Square meters, Buildings 25% – Landscape 60% – Roads and passages 15%.